Ring News 24Boxing News Breaking Boxing NewsIs Terence Crawford running out of options after Amir Khan? On April 20th, the next pay per view in the sport of boxing will take place when Terence Crawford defends his WBO welterweight championship vs. former world champion Amir Khan. The fight is set to take place from Madison Square Garden in New York and will air on ESPN pay per view. Crawford is undoubtedly a huge betting favorite heading into the fight, according to the boxing related bookmakers. 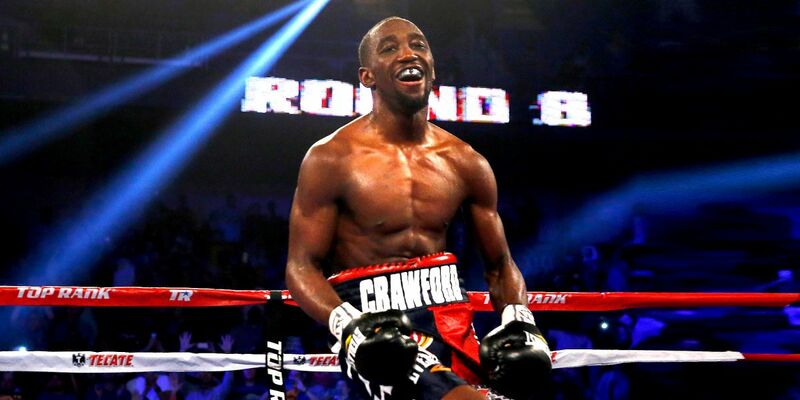 Crawford possesses a 34-0 record (25 KO’s) and has shown himself to be a versatile fighter who can switch and hit from both sides, box his way towards victories, and even hurt his opponents on more occasions than not. Khan, meanwhile, still looks a little bit rusty following his brutal knockout loss to Canelo Alvarez nearly three years ago. He has followed that fight up with a blowout victory over Phil Lo Greco (1st round KO) and a decision over tough gatekeeper Samuel Vargas, a fight in which he was dropped yet won a wide decision. The fight figures to be exciting, but you have to wonder, if Crawford defeats Khan, what is next for him and what could some of his future opponents present? There is no secret that the sport is somewhat fractured these days from a promotional and networks standpoint. Crawford is promoted by Bob Arum’s Top Rank, who have an exclusive partnership with ESPN. There is also the streaming service DAZN, which boasts some big names like Alvarez, Gennady Golovkin, Anthony Joshua, Oleksandr Usyk, despite still being in its early phases. And several of the top welterweight names are aligned with adviser Al Haymon’s Premier Boxing Champions banner, including WBC champion Shawn Porter, WBA champion Keith Thurman, IBF champion Errol Spence, Manny Pacquiao, Devon Alexander, Omar Figureroa, Yordenis Ugas, comebacking Marcos Maidana, and many others. The one fight that people want to see Crawford in is a dream matchup vs. Spence. Just last month, at the AT&T Stadium in Dallas, Texas, Spence dominating Mikey Garcia over 12 rounds to raise his stock in the game even further. Now the rumors have Spence lined up with a possible summer showdown against Porter. After that, his options would be very robust. If Crawford vs. Spence doesn’t happen for promotional reasons, we could see Spence face a long list of top welterweights and he could even take on the challenge of moving up in weight to face off with unified junior middleweight champion Jarrett Hurd if need be. Crawford, meanwhile, appears to have limited options. There were talks of him facing former champion Luis Collazo before Khan’s name emerged, and that isn’t a bad fight, but one that wouldn’t be a huge fight either. Top Rank does have some welterweight prospects they are working with, such as unbeaten Alexander Besputin and Egiidijus Kavaliauskas, but neither is anywhere near ready for a fight with Crawford. Arum has expressed his desire to make Crawford vs. Spence and if that were to happen he would have to be open to a co-pay per view with Haymon, much like they did with Floyd Mayweather vs. Manny Pacquiao in May of 2015. Let’s hope that scenario can happen, otherwise it’s hard to think of many intriguing options for Crawford.